Biting or scratching is usually the first reaction of an animal with fleas. Some animals may begin excessive grooming to try to rid themselves of the irritation, eating many of the fleas in the process. Light-haired dogs or cats who do this may develop an orange-brown discoloration due to salivary staining. These general symptoms are usually referred to as pruritus. Some animals have a higher tolerance to fleas and aren't disturbed by them. Others suffer varying levels of irritation and may show a reaction after only one bite. Dogs and cats that are hypersensitive to flea saliva have intense reactions, often out of proportion to the number of fleas on the pet. Recent research indicates that FAD may be caused by intermittent exposure to large numbers of fleas. Animals sensitized in this way may subsequently become intensely reactive even when only a small number of fleas are present. This is significant as it suggests the way to prevent FAD may be to prevent the repeated exposure to flea infestation. The pruritus, or itching, that occurs in dogs with FAD is intense, and results in self-mutilation. Generally, clinical signs are distributed over the inner thigh and abdomen and along the spine and hindquarters. Corticosteroids are often used to temporarily relieve clinical signs, and this recommendation must come from your veterinarian, but a flea control program is needed to resolve the problem completely. This particular species of tapeworm must use the flea as an intermediate host in its own life cycle. Egg packets deposited by the adult tapeworm are shed into the environment where they are consumed by the flea larvae. If a pet ingests an adult flea that consumed the tapeworm egg pack as a larvae, the tapeworm parasite is passed on. Although tapeworm in pets usually doesn't cause serious disease, it is particularly annoying to pet owners. Tapeworms are easily detected by the pet owner. Small rice-like objects are seen clinging to the hind end of the animal near the base of the tail, and their presence usually evokes a feeling of disgust in most owners. In addition, people can become infested if they inadvertently ingest infected fleas. Being blood-sucking insects, fleas can produce parasitic anemia in heavy infestations, particularly in young animals. Fleas in the genus Ctenocephalides have been reported to produce anemia in dogs, cats, goats, cattle and sheep. Severe flea infestations in young pups can cause anemia to the point of death. 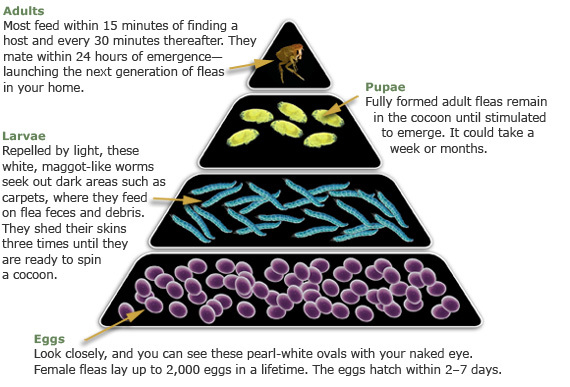 Fleas are able to reproduce on any mammalian blood supply, including humans. However, a female flea must feed for a prolonged period of time in order to begin egg production. Fleas may spend 2-3 hours sucking on one spot and most humans will scratch or perform some other action to interrupt this feeding process. As such, the flea is not able to feed for the required length of time to produce eggs. Disease transmission due to fleas in man is not a common occurrence, but any suspected reactions should be discussed with your doctor.